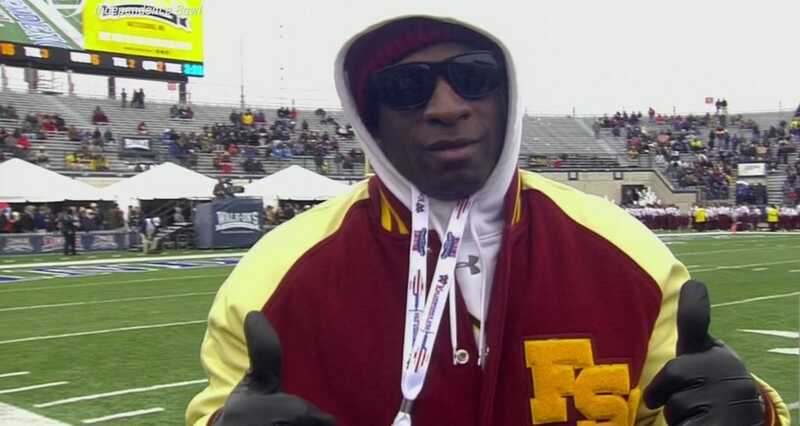 Multiple reports have said Hall of Famer Deion Sanders is in talks to return to Florida State as an assistant coach. Sanders was asked about the reports during the Independence Bowl and danced around the question. Sanders was complimentary of new head coach Willie Taggart. Deion Sanders danced around a question when asked about reports that he is in talks to return to Florida State as an assistant coach. Both ESPN and Noles247 reported that Sanders was in talks with Florida State about joining new head coach Willie Taggart’s staff. According to Noles247, Taggart and Sanders have “mutual interest.” ESPN reported that Sanders was in “early discussions” about becoming a coach at FSU. Sanders was a 2-time consensus All-American as a defensive back at Florida State and finished eighth in the 1988 Heisman Trophy voting. Sanders was also a college roommate of Florida State’s current interim head coach, Odell Haggins. Sanders was highly complimentary of Taggart, noting he has Taggart’s back even when he was not asked about the coach. Taggart was recently hired by Florida State to be their head coach after Jimbo Fisher abruptly left for Texas A&M. Taggart was previously the head coach at Oregon.